We have been traveling the Hudson River Art Trail, seeing the landscapes that so inspired the great American artists of the 19th Century. But ours have not been the journeys of art historians, but those of geologists. We are privileged to see what the artists could not; we can look into the distant past. Last time we visited Frederic Church’s Persian Revival house Olana and we saw the ice age history of that site. 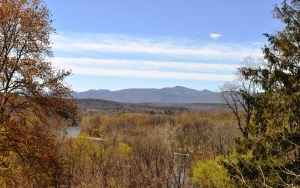 In this journey we visit what may have been Thomas Cole’s favorite scene: that is the view of Catskill Creek from Jefferson Heights just west of the Village of Catskill. That location was just across Catskill Creek from Cole’s home. He frequently hiked there and composed views. In the foreground there was a great bend in the creek as it flowed by below. That was scenic enough, but in the distance it all got better. Out there was the Catskill Front, the fabled Wall of Manitou, lying on the western horizon. In a recess on that distant horizon, but still close enough to be seen, were the lower stretches of Kaaterskill Clove. Cole seems to have done a dozen or so paintings at this location. Like any good artist he experimented. He tried out the scene at different times of the day and during different seasons of the year. His art can be called luminism; he liked to place the sun in the far distance and paint its light shining down and across the landscape. He could vary the sun’s color with the time of the day, saving deep reds and oranges for late afternoon. He returned to the site as the years went by, and painted changes that had occurred there. Much to his dismay he saw a railroad line put in. He lamented the encroachment of industry on what had been a purely pastoral image. Landscape artists do not celebrate industrial development. As the generations have passed since Cole’s time, a different sort of development came along: the forests returned. At least the trees did. They grew up and blocked Cole’s cherished view. When we first searched for it, we could not find it; it was hidden by the foliage. When the Art Trail was developed that posed a problem. The trail guide leads visitors to a nearby restaurant site, but you just cannot obtain a good view there. Thomas Cole’s grand scene seemed to have been lost to the very Nature he painted so well. But, very recently, that all changed. At the top of the hill, at Jefferson Heights, a new sidewalk was installed. You can walk it and look to the west and, especially during the winter, you can see Cole’s bend in the river, right in front of you, and in the distance, the Catskills are out there too. It’s not as clear a view as Cole had, but it’s pretty good. We were thrilled when we first found this. We were sharing a moment with Thomas Cole and the whole Hudson River School of Art. But we also saw this view as Cole couldn’t; we saw it about 15,000 years ago, at the close of the Ice Age. As geologists we get to pick exactly what times we go back to and visit. With our mind’s eyes we can witness those moments. And, for this journey, we picked a very good moment to visit. We wanted to see the Cole view as it was when the ice was melting. But we also wanted to see that view on the day when the melting reached its all-time peak. There had to have been a day and an hour when a warming climate was melting an absolute maximum of ice. That was the very moment when more water was cascading down Catskill and Kaaterskill Creeks than ever had before or ever would again. The channels and valleys of these streams strained to contain the flow – and failed. We stood upon the same Jefferson Heights site, but for us it was that exact moment, 15,000 years ago. Below us, a vastness of water was pouring down the creek. It ignored the bend in the river as its flow rose and swelled up to overwhelm the whole valley. What we saw was a horizontal waterfall. The water presented a mixed image, contrasting its own gray brown colors with whitecap whites. This torrent swirled, and foamed, and thundered as it rushed by. The power of the flow was frightening; the sound was deafening. This was the full fury of Nature, displayed in a riotous image. We looked up, all the way beyond to distant Kaaterskill Creek. Even in our mind’s eyes we could not travel that far. It must have been much worse out there, with a still greater flow of water coming down that steep canyon. We strained to see and were frustrated that we could not. We debated it and finally convinced ourselves that we were seeing a large rainbow rising above the mouth of the Clove. It was too distant for us to be sure. We were awed by all that we beheld and we fully understood that we were seeing history in the making. What we were watching was nothing less than the great rising crescendo of an ending Ice Age.